DANNY Ward believes both he and Aberdeen can embark on a positive run following his crucial home debut clean sheet. 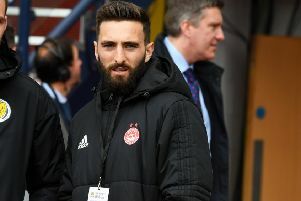 The goalkeeper kept out Shkendija in a goalless draw at Pittodrie on Thursday night to see the Dons through to the second qualifying round of the Europa League via the away goals rule. I’m very happy to get through and personally to get the clean sheet and get the first game at Pittodrie out the way. Ward was previously thrust into the action in Macedonia days after joining from Liverpool on a season-long loan deal and he was delighted to secure a trip to Croatia to face Rijeka when he pushed wide a 20-yard strike in injury-time. The 22-year-old told RedTV: “I did see it late and thankfully got a hand to it. But the back four were great all night. Every time they were called upon they stuck their head in, stuck their foot in, got their bodies in the way. Scott Brown kept eight consecutive Premiership clean sheets last season, and 17 in all in his first season at Pittodrie, but Ward was immediately elevated above both the former Cheltenham keeper and the long-serving Jamie Langfield. “The reason I came here was to hopefully get games and thankfully the manager has put his faith in me this early in the season,” the Wales squad player said. “I’m very happy to get the first two games under my belt. Aberdeen now travel to Croatia next Thursday to face a team that have a decent pedigree in Europe in the past two seasons. They won all six qualifying legs last term and beat Standard Liege and Feyenoord at home in the group stages, and drew with holders Sevilla, who went on to retain the trophy. The previous season, Rijeka knocked Stuttgart out in the final qualifying round. But Ward believes Aberdeen can draw confidence from their opening triumph. “We knew what they were about from last week, they are technically very good, a lot of good players, a lot of internationals,” he said. “So it was a good test for us, especially so early in the season. “So I’m very happy to get through and personally to get the clean sheet and get the first game at Pittodrie out the way. “You can’t take any team in Europe for granted, They were a very good team, very well-organised and hard to break down. Getting through a test like this can only help us go from strength to strength now.